but deep down he knew it was the right decision. I normally reserve kudos for athletes for those that have done something charitable or some other admirable way off-field. Aaron Rodgers has done his part with the itsAaron campaign, but in reading post-game commentary after the Packers miraculous win over the Bears, he added a new level of respect. After having missed almost half the season due to a broken collar-bone and what may have seemed like mollycoddling by the team doctor Pat McKenzie, Rodgers didn't bemoan the extra games lost due to the care, but praised it. This is something men in Milwaukee, and Wisconsin, and the world need to be pay attention to. Rodgers trusted the doctors and it paid off. We all know men are infamous for mishandling health issues including injuries, but Rodgers gives a lesson in how and why we should all follow through on doctor's orders, even praising McKenzie for keeping his personal health interests in mind rather than complaining about being kept out so long as many expected. In numerous reports today, Rodgers is being quoted as praising McKenzie for how he handled things, especially for looking out for Rodgers' long-term health. In an interview with Sports Illustrated’s Peter King, Rodgers said “Sometimes, doctors need to step up and save players from themselves, and I felt that’s what Pat did in this case. 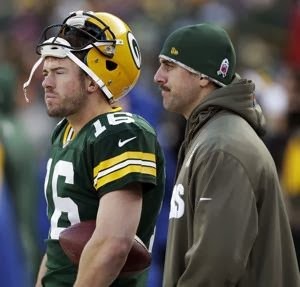 I felt every week he was doing what was in my best interests, even thought I didn't agree with him all the time—not at all.” Earlier he gave some insight into how all the Packers players feel about their team doctor. "I trust him and care about him a lot as a friend and also as somebody who counsels me when I'm injured." Credit needs to go to the entire Packers organization, at any time they could have overruled McKenzie and with the season on the line for the past few weeks rushed Rodgers back in due to the typical win-now mentality of pro sports. But they at least had the future of the team in mind, and likely Rodgers as well, when they listened to McKenzie and made sure their star QB was fully healed before sending him back in. But in today pro sports environment, Rodgers' star power could have likely influence management to put him in regardless of McKenzie's recommendations, but he never played that card. He respected, listened to, and heeded the input of his doctor and did what he needed to to fully recover - an example we men need to follow. It can be easy whether millions or hundreds of dollars are at stake, your personal and possibly family's welfare, to rush to get back into 'the game'. But we need to remember that we can do worse, longer term injury and loss of time and money, if we don't take proper care.